Indiana University President Michael A. McRobbie reported today on a record-setting year for the university as it continues to strengthen its commitment to student success, world-class research and scholarship, as well as service to the civic, cultural, economic and social life of Indiana. During his annual State of the University address, his 10th since becoming IU president, McRobbie also announced several new initiatives designed to preserve, recognize and strengthen IU's heritage and legacy as the university moves forward with planning for its bicentennial celebration in 2020. "Indiana University remains steadfastly committed to providing an environment in which students have every opportunity to succeed -- by ensuring that an IU education remains affordable, that we adopt practices and policies that encourage students to persist to graduation and complete their degrees on time, and that the university’s schools and programs provide a relevant education of lasting value," McRobbie said. Speaking from the Indiana University-Purdue University Indianapolis campus, McRobbie outlined several of the university's achievements of the past year, which have helped advance the major priorities of the university'sBicentennial Strategic Plan, approved by IU trustees in 2014. These included the conferral of a record 21,204 four-year and graduate degrees in 2015-16 and the enrollment this fall of one of the most academically accomplished and diverse student bodies in IU history. IU's current enrollment includes a record of nearly 20,000 minority students. McRobbie also shared a number of other record-breaking successes, including IU securing nearly $1 billion in external funding for research and other activities and in private philanthropy in fiscal year 2016; the selection ofPrecision Health Initiative as the first recipient of research funding in IU's $300 million Grand Challenges Program; and a reduction in student borrowing by nearly $100 million in the four years since the university began a multi-faceted financial literacy program and introduced efforts to increase student financial assistance and promote on-time graduation. These and other successes have occurred during a time of major growth and transformation across IU campuses statewide and as IU fully realizes a longstanding goal of being a more "complete university," McRobbie said. In the past five years, IU has established or transformed eight schools, while also strengthening its programs and activities in the areas of art and design, global and international studies, informatics and computing, media, medicine, philanthropy, public health and online education, McRobbie said. Additionally, IU has recently introduced several new academic initiatives, including a program in engineering in Bloomington that welcomed its inaugural class last month. During his address to IU faculty and staff, McRobbie introduced the first of several new programs concerning the preservation, enhancement and recognition of IU's heritage as part of its bicentennial anniversary, which will commence during the 2019-20 academic year. The launching of two new grant programs to encourage faculty, staff, student organizations and IU affiliates to develop and propose bicentennial projects and to develop or revise courses that encompass bicentennial goals. The development of a university-wide Historical Marker Program, modeled after the state of Indiana historical markers, that will document people, places, events and organizations of historical significance to IU. The establishment of the IU Bicentennial Oral History Project, which will encompass interviews with alumni as well as current and former faculty and staff members, who will provide important documentation of the university's past and present. The creation of a public art restoration fund to be supported, in part, by the estate of IU's 10th president, William Lowe Bryan, to be known as the Bryan Public Art Restoration Fund. The fund will facilitate the maintenance and restoration of public art on all IU campuses and allow for the continued presence of public art in IU's outdoor spaces. 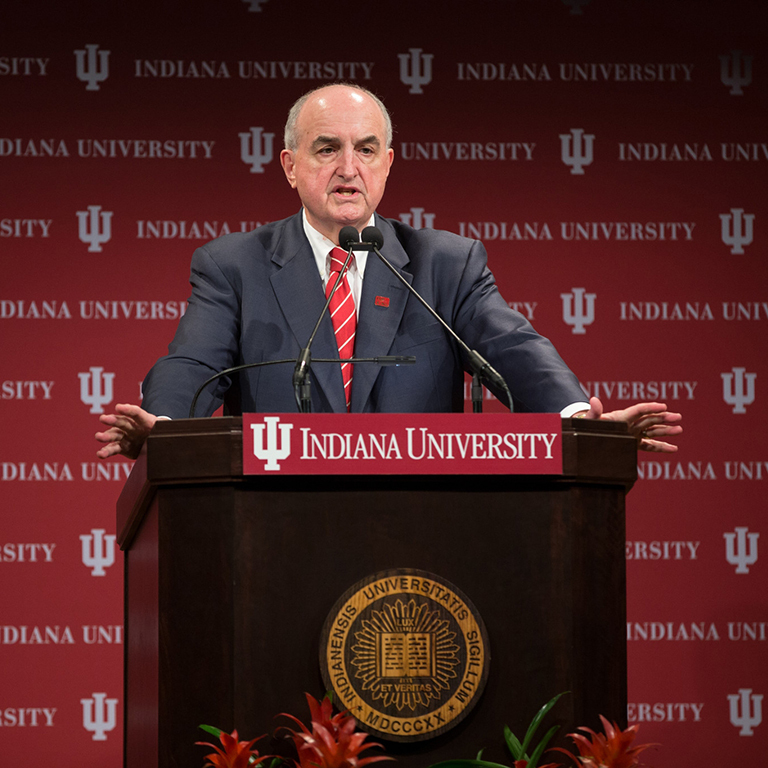 As part of its bicentennial-year planning, McRobbie said IU will continue an extensive effort to restore, repurpose and modernize academic and residence hall facilities on all of its campuses to better support the educational and research missions of the university. To this end, IU has set a goal of renovating all of the residence halls on its Bloomington campus, which have a total capacity of about 11,000 students, by 2020. The task is currently about 75 percent complete, McRobbie said. IU Bloomington and IUPUI also continue to implement their campus master plans, which have revitalized underutilized and out-of-date buildings and iconic spaces at both campuses. Last week, McRobbie participated in the dedication ceremony for North Hall, the first traditional residence hall at IUPUI since the campus was founded in 1969. Later this month, he will rededicate Franklin Hall at IU Bloomington, a 1907 building that is serving as the state-of-the-art home for the university's new Media School. McRobbie also shared an update on the university's work to preserve its cultural heritage and, more specifically, the approximately 400,000 tapes, reels, cassettes, films and wax cylinder recordings that were at risk of being lost forever from future generations. Last year, IU formally launched the IU Media Digitization and Preservation Initiative, first announced in McRobbie's 2013 State of the University address. This week, the initiative will surpass the 140,000 mark in digitizing many of IU’s audio and video recordings, housed at IU Bloomington, IUPUI and the university's regional campuses. Among these media objects are rare recordings of legendary IU music professor David Baker, who passed away in the spring, and recently discovered, previously unknown recordings of IU alumnus Hoagy Carmichael at IU Auditorium. IU's new bicentennial programs and efforts to preserve the university's physical and recorded heritage will form a "central part" of IU's activities leading up to and during its bicentennial year, McRobbie said. "A key goal for all IU campuses as we approach the bicentennial is to build on and enhance the character and ethos of the campuses to make them magnets for the best and most deserving students, and environments that will help foster excellence in education, research, scholarship and creative activity." The full text of McRobbie's address is available online. For an archived broadcast of the State of the University, go to broadcast.iu.edu.